My Scotland blog will take you on a virtual tour of the most beautiful country in the World. I’ll be sharing all of the best places to eat, sleep and play with lots of stunning scenery along the way. Introducing a Scotland blog with an adorable USP! A new Scotland blog – hmmm where to begin? Ok, here goes – I’m Samantha but I usually go by the name of Sam, Mrs G or Mum. I have a passion for exploring Scotland with my hubby Mr G. Our trusty, four-legged friend is rarely far from our side. He’s The Wee White Dug aka Casper, or Merrylegs Lord Toby to give him his posh name! But, shhh don’t let him know I’ve shared that hilarious little nugget with you! When our activities or destinations are deemed sufficiently interesting we’re also joined by our Daughter, The Teen. But, back to the namesake of this blog Casper, the Wee White Dug. He’s a typical Westie – he’s naughty, loving, bolshy, funny, loud and a little bit crazy – sometimes all at once. He makes me laugh and I absolutely adore him – my hairy-faced baby and unashamed Mummy’s boy. Why a blog? Well, my friends joke that Casper has a better social life than they do, as he’s always on the road exploring, exciting new places. I’ve been encouraged to document our travels and share our stories. So here I am dipping my toe tentatively into the water, and setting up this blog thingy so I can start sharing our 2016 Scottish adventures with you – whoever you may be. So what drives me (other than my lovely hubby Mr G, in his car which now has more mileage than a space shuttle thanks to my wanderlust) to spend all of my spare time on the road exploring Scotland? I’m hugely passionate about all things Scottish and am fascinated by the language, customs, myths, literature and history of my country. I think it’s vitally important that they’re shared in order to protect and preserve them for future generations to enjoy. My blog will be peppered with all of the above but with a generous dollop of history, as I’m a history geek and proud! Before I start documenting 2016 I’d like to reflect on 2015. It’s a very Scottish thing to reflect as the year draws to a close. 2015 is a year I’ll remember fondly as one were I was lucky enough to enjoy some amazing trips. The photo above was taken in August at Machrie Moor on the Isle of Arran. It’s somewhere I’d never visited before as I wasn’t sure it’d be my cup of tea, boy was I wrong! These ancient stones were out of this world. I was totally blown away by them and Casper seemed to love them too. We’ll definitely return to explore more of Arran soon. The photo above was taken on one of several trips we took to Glencoe at the beginning of 2015. Glencoe is spectacular, and that little cottage is a firm favourite with photographers. It’s a place so naturally beautiful it often looks surreal. We prefer to visit in the winter months when it’s quieter and more often than not dusted with snow. I love the wild deer which are a permanent fixture outside the Kings House Hotel. Although wild, they’re greedy and can be hand fed. I take them oatcakes which they gratefully devour in record time. They’re mercenary though, and will even kick their young as they compete with each other for an oaty treat. I can never leave until I know they’ve all eaten something, so it often turns into a bit of a marathon feeding session. Why oatcakes you might ask? Well, I reckon oatcakes are a reasonably healthy snack and won’t lead to an obesity epidemic amongst the Scottish deer population. The photo above is of one of Scotland’s most instantly recognisable castles, Eilean Donan. It was taken in April en-route to Harris and Lewis. We were lucky that day, as the sky was bright blue and the water reflected beautifully. I can never pass Eilean Donan without stopping to admire it. I attempted to set Casper up for a photo here but he was having none of it. Photos of Casper generally involve a lot of pleading, coaxing and bribing with beefy treats! I met this guy at Uig on the Isle of Lewis, where the famous Lewis Chessmen were discovered on the beach. Their expressions are really comical. There are a few pieces in the National Museums of Scotland here in Edinburgh, which incidentally is my home. Not the museum though, Edinburgh the city with the medieval castle on a rock in the centre of town. Anyway, this was meant to be a quick intro to my new blog. You’ve probably realised by now that I’m a blether (Scots for likes to talk – A LOT!) and here I am still waffling on despite having set the scene for this blog a good couple of hundred words ago! I really hope that you’ll enjoy journeying with The Wee White Dug and I, as we embark on a wonderful Scottish adventure to share the best bits with you here in this new Scottish travel blog. Next Away with the fairies on Doon Hill! Thank you so much for taking the time to read the blog and for your kind comment. You’ll love Scotland. Please let me know if you need any hints or tips for your visit. Caspar is gorgeous! I have a Westie too who also matches your description. Loving this. Brilliant pictures of some of my favourite places and that wee dug makes them look all the more special. I was SO happy to find this blog! 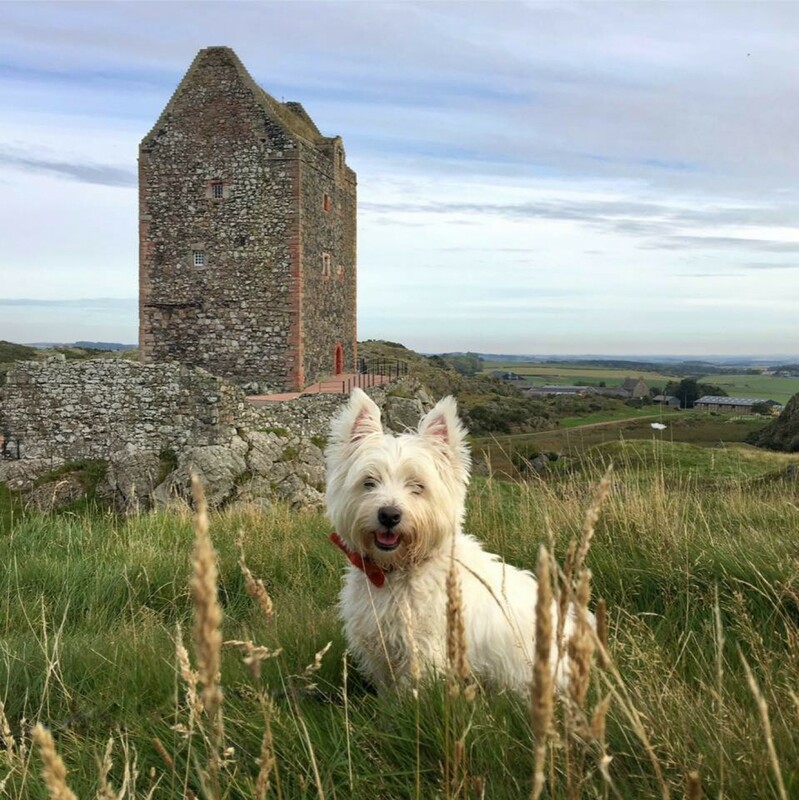 Wonderfully written by someone who is experienced in and loves Scottish travel and history, lovely photography, AND a wee white Westie?! I will gladly stalk this blog for as long as it exsists. I absolutely adore Sdotland and the rich history it holds. I am quite excited to see what the next year holds for you and Casper! Thank you for stopping by. We look forward to you joining us on our travels. Sam, I’ve been following you on Instagram for a while and so happy about your blog. My heritage is Scottish (Aberfeldy) and I plan a long trip to Scotland for my 50th birthday in 2019. I’m using your feed as inspiration and now your blog as well. My name is also Samantha and I have a wee Morkie named Charlie. Happy New Year! My instagram is @kaisersamantha. It’s not nearly as nice as yours!! What a fine idea, Sam, and looking forward to following your adventures! Also, very nice blog format, with a good balance of words and pictures. Sam, glad to share your blog on our page https://www.facebook.com/JTB47/ and I am sure it will go from success to success. How fun that Casper has his own blog (sort of) now, Sam!! Will be fun to follow your adventures both here and on Instagram. Super beginning Sam. You know I’m already fond of you and your travels with the 2 young men, so very much looking forward to more. Best of luck for success with your new blog! Sam I look forward to your adventures with Casper. I just started watching the Outlander series. I’m in love with Scotland’s rugged beauty, and hopefully I can venture one day and see it in person. Thanks for reading Michele – I watched the series recently and loved it. I’ll be visiting some of the film and book locations soon so watch this space. A brilliant start. I’m impressed. Congrats. We are looking forward to your 2016 adventures, especially with Casper! Both my kids live animals alas we have none of our own yet so we will make do with your cheeky boy for now! Yea! Great start to your blog, Sam. Maybe a book is in your future. Casper is a great model! The Machrie Moor was my favorite spot on Arran in fact I have a canvas print enlargement on my living room wall of a shot I took there. Thanks for sharing your travels with us! Thanks Eileen. Appreciate you taking the time to read. It’s such a beautiful spot isn’t it. Sam, I look forward to following your Scottish adventures with Casper. Thanks for sharing. Thank you for taking the time to read. We look forward to you joining us.